I woke up early this morning to bake for LN who ordered 24 chocolate cupcakes for her dinner party tonight. Knowing me, I couldn't make 24 identical cupcakes (too boring!) so I presented them in different ways! This is a flower shaped chocolate cupcake with vanilla cream cheese frosting and a chocolate chip cookie on top! I presented it on a piece of grease proof paper and a red tie just for fun. Another flower shaped cupcake with coffee flavoured cream cheese frosting, a dusting of cocoa powder and a mocha chocolate coffee bean topping. For this cupcake, I added white chocolate chunks in the cake batter and a giant Hershey's kiss on the frosting with a dusting of cocoa powder. This is my regular "Resistance is Futile" cupcake with a piece of Mars bar inside giving the cake a yummy fudge and caramel centre. A dusting of icing sugar and gooey chocolate syrup completes the presentation. Last, but certainly not least is this cupcake with a peppermint cream cheese frosting and an Andes peppermint chocolate to top it off. Quite refreshing and pleasant to the palate. Until my next order or sudden urge to bake, have a great weekend! My hubby and I spent a couple of hours last night watching TV (a luxury I've not been able to indulge in for the past few weeks!) and flipping through my baking books looking for new ideas and learning tips. I finally made baking plans for today so woke up early to accomplish my goals. Since we were going to visit my sweet chiropractor, Dr Shara Downey at Asia Chiropractic, I decided to try a simple back-to-basics cinnamon cupcake recipe with no fuss or frills. I tweaked the recipe a bit and the feedback from Dr Shara was that the cupcake was lighter. That was what I was hoping for! Hurray! This is the simple cinnamon butter cupcake with a sprinkling of powdered sugar. When we got home after lunch I decided to go get some more baking supplies and bought a new brand of chocolate. So I decided to try it out since Alethea's having tap class tonight and I can let her teacher at Jitterbugs, Tiffany Wrightson, be the first to try this recipe! Here's the closeup. The recipe yielded a very tender and moist cake. I simply love it and will use it for all my chocolate cupcakes now! It's my hubby's favourite now. The inside of the cupcake holds a surprise! Yes, fudge and caramel! For my presentation I think I will just dust the top of the cupcakes with powdered sugar and drizzle with chocolate syrup. For Saturday's order from LN I will add a cream cheese frosting. Look out for more photos! This week I've a small order to bake on Saturday but between now and then I plan to make some cream puffs and eclairs. I'll try out my old custard recipe and buttercream as well. My daughter loves profiteroles which is cream puffs (without the cream or custard) and good old ICE CREAM! 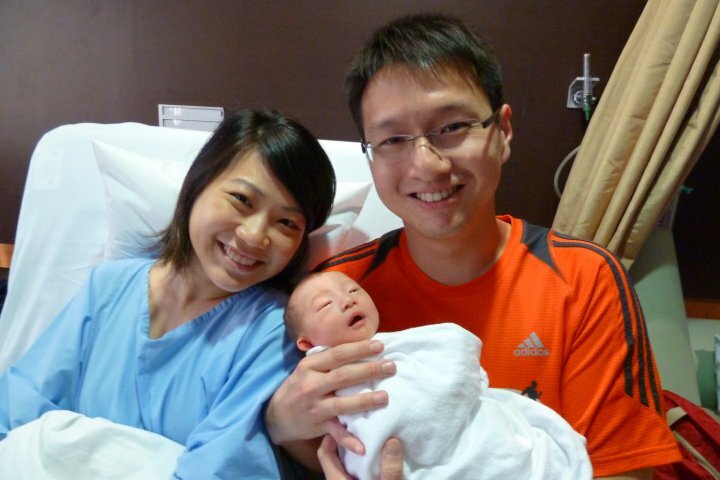 Jolene and Chai Meng's brand new baby Qi Zhe. Alethea and I visited Jolene on Sunday at the hospital and brought chocolate cupcakes for her to serve to her visitors. She looks really good, doesn't she? Check back later in the week and hopefully I'll have photos of my cream puffs, profiteroles and eclairs! The baby shower at our place. All of us were wearing "necklaces" made from baby clothes, socks and bibs! Of course J and CM got to bring home all the necklaces as they were part of a gift from my family to them. Alethea has great fun making a "stork" out of gift wrap to hang in the living room. She also helped to make the decorations. I gave them 16 cupcakes in a box. I hope it's enough! Congratulations, J and CM on the arrival of your first baby! Have a great time parenting him! "Resistance is Futile" - triple chocolate with a surprise centre. Dense, moist and rich. For the chocoholic! Plain cupcakes (recommended) - $3 each with a minimum order of 18. Butter frosting (plain or coloured) - $3.50 each with minimum order of 18. American Carrot Cupcakes - freshly grated carrots, walnuts, pineapples chunks, black raisins, muscovado sugar, vegetable oil instead of butter. Moist and healthy. Low fat cream cheese frosting. Choice of sprinkles, chocolate chips, M & Ms or walnuts for topping. $3.50 each with minimum order of 18. $35 for 9-inch cake minimum order of 2 cakes. Note: Needs to be refrigerated. Oreo Cheese Cupcakes - Oreo cookie as the base, cream cheese and oreo bits in the cheesecake. Peach or Apple Crumble Cupcakes - canned peaches or freshly grated Granny Smith apples, vegetable oil instead of butter, raisins, cinnamon and a crunchy topping. Light and refreshing. One fruit - $3 each for a minimum order of 24. Mixture of fruits in box - minimum order of 36. Banana and Banana Orange Cupcakes - ripened bananas, cinnamon, vegetable oil instead of butter, juice from fresh oranges, light Muscovado sugar. Moist and light. Plain - $3 each with a minimum order of 24. Frosting - $3.50 each with a minimum order of 24. Butter Cupcakes - Vanilla, Coffee, Chocolate, Peppermint chocolate, Orange, Strawberry and Rum n Raisin. Rich, buttery old-fashioned butter cake recipe. Plain - $2 each with minimum order of of 24. Butter frosting with choice of sprinkles or chocolate chips - $2.50 each with minimum order of 24. I also bake Brownies, Pineapple Upside Down cake, Banana Cake, Banana Orange Cake, Orange Cake, traditional Fruitcake (need 4 months' notice! 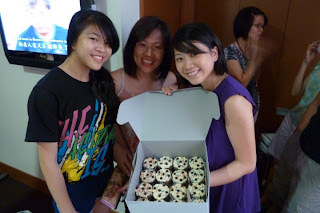 ), Cornflake cookies, Chocolate Chip cookies, Coffee cookies, Coconut cookies and heart-shaped Pineapple tarts. If you have a special request, let me know and I'll see if I can help you with it. Please email me at rebeccayam@ymail.com with your order at least 5 days in advance. For orders of more than 100 cupcakes, I need at least a week's notice. Free delivery is available for orders above $100 in the north, central and west. Free delivery is available for orders above $120 in the east. Orders can be picked up from Woodlands.